For the last 15 years, Labor Day Weekend at Raceway Park has been the site of the Vet and Vintage Reunion. The Kessler Pro Suspension sponsored event takes place on the Saturday of the long holiday weekend and runs a complete schedule of motos for all veteran classes, as well as a complete Vintage program. Bright and sunny skies greeted all the competitors that spent their afternoon at the track. One of the most anticipated classes of the day was the Over 30 Expert class. 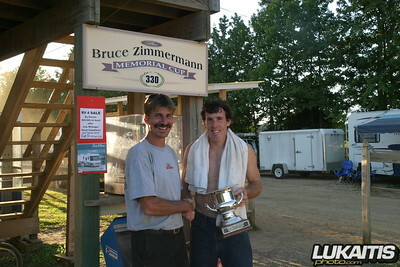 The overall winner in this class would take home the coveted Zimmermann Cup, which was designed as a memorial to longtime racer Bruce Zimmermann, who died while jogging several years ago. His friends got together and, with the help of Mickey Kessler, the Zimmermann Cup was formed. Past winners read like a whose-who of the local Vet Expert field, including three-time winner Jim Kapitan, Jimmy McIlvaine, Jerry Seip, Rich Zupko, Brian Carroll, Joel Dengler and last year’s winner, Rich Zupko. A full gate of riders lined up to kick off the Zimmermann Cup race but it was all about Barry Carsten. The Bromley’s/MSR/Arai/Scott Suzuki rider showed why the number on his bike is a national one and Barry went on to convincingly win both motos taking the overall and the Zimmermann Cup Trophy with him as well. At 40 years old Carsten still competes in an occasional national and if not for missing a couple of round due to injury he would have probably earned another national number. 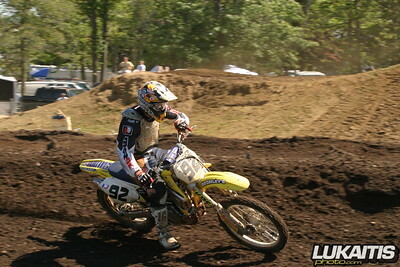 Carsten was not done just winning one class or a couple of motos. 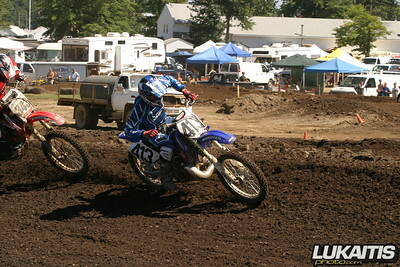 He went on to win both motos in the 25+ Expert and 40+ Expert classes as well going a perfect 6 for 6 on the afternoon. A complete schedule of Vintage classes was run as well for bikes back to the beginning of motocross all the way up to the more modern eighties and nineties. So if vet or vintage racing is your thing check out Raceway Park next Labor Day weekend or see the website at www.racewaypark.com for a complete schedule.